Former Scottish U18 girls champion Hazel MacGarvie (Troon Ladies) opened up a useful lead with a brilliant round of eight-under-par 67 over the New Course, St Andrews in the first round of the prestigious St Rule Trophy 54-hole tournament. MacGarvie's scorecard had an eagle at the 10th and seven birdies (second, third, sixth, seventh, ninth, 13th and 16th in halves of 32 and 35. It was not quite a perfect round - Hazel, pictured below, who will be 19 in October, dropped a shot to par at the 14th. The women's course record for the New Course, achieved by England's Gemma Clews, now a professional, with a score of 65. MacGarvie leads by three from Eilidh Briggs (Kilmacolm), Jessica Hall (Bishop Auckland) and Ireland's Shannon Burke (Ballinrobe). 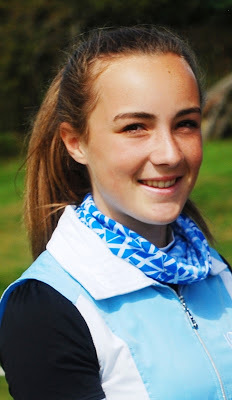 Hannah McCook (Grantown on Spey), recent winner of both the Welsh and the Irish women's open amateur stroke play title on consecutive weekends, is sharing fifth place on 71. Defending champion Clara Young (North Berwick) had a disappointing opening round of 78 which left her languishing in a share of 47th place. The field of 60 play another 18 holes over the New Course today and the tournament ends with a round over the Old Course on Sunday. 70 S Burke (Ballinrobe), E Briggs (Kilmacolm), J Hall (Bishop Auckland). 71 L Bailey (Kirby Muxloe), Romy Meekers (Netherlands), C Gainer (Castle Royle), H McCook (Grantown on Spey). 72 C McGinty (Knowle), K Andrew Clitheroe). 74 H Morgan (Hallamshire), H Allsebrook (Shifnal), G Batty (West Linton), T Mactaggart (Minto), C Goadby (St Regulus Ladies). 75 C Ryan (Castletroy), E Berlin (Swe), J Mackintosh (Hazlehead), S Madden (USA), E Slater (Gog Magog), S Wooster (Australia), C Casey (Hermitage). 76 C Walsh (Castlewarden, M Dowling (Lucan), G Blackman (Chelmsford), S Sexton (Lahinch), C Taylor (Nairn). 77 K Beveridge (Aboyne), M Garland (Selby), M Stasi (USA), E Lewis (Long Ashton), G Price (Bude and N Cornwall), K-J Stanley (Manchester), M Giles (St Mellion), A Collis (Letchworth). 78 M Wood (Woodsome Hall), G Macdonald (Craigielaw), C Young (North Berwick), K Brodie (Strathmore), N Slater (Woodsome Hall), E Healey (West Lancs). 81 M Revilliod (Fra), L Brunt (Royal Birkdale) E Toy (Carlyon Bay).